Girls' softball shorts aren't the simple shorts you or your mom played in years ago. Today, softball shorts are designed to meet the needs that serious players have when it comes to this highly competitive sport. Sliding shorts: These shorts are designed to protect girls as they slide into base. Used both in slow pitch and fast pitch softball, slider shorts have pads in the pants that protect tender skin when players hit the ground and slide into base. Moisture-wicking shorts: Made of moisture-wicking material, these shorts are perfect for those hot days and steamy nights of ball-playing. Cut: Depending upon a team's preferences, girls' softball shorts come in short or long full cuts. Many teams prefer the longer version as it provides more protection to players' legs. Reinforced construction: The construction of the shorts you choose is certainly important. Take a look at the stitching to see if it is reinforced to withstand rough playing time. Internal drawstring or snaps: What type of closure do you prefer on your shorts? While some come with internal drawstrings, others feature metal snaps. When choosing softball shorts for your team, consider a variety of colors. Shorts and shirts often feature a three color design. These colors include the base color of the primary material, a contrasting color for any numbering or lettering, and finally a coordinating color in the piping on the shorts. Many teams order all the uniform pieces from one particular store, but others allow players to purchase their own shorts in a stated color while providing the game shirt and hat. 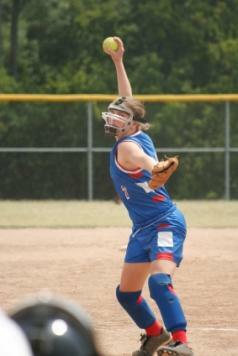 The following is a list of online merchants that offer softball shorts in a variety of styles. Homegrown Sporting Goods: This site features softball shorts in a variety of colors, styles, and sizes. Materials available include dazzle polyester, shadow styles, moisture-wicking polyester, and mesh polyester. Sportswear brands include Augusta Sportswear, High 5, and Teamwork Athletic. She Plays Sports: Featuring custom and stock designs, this site has a nice selection of softball shorts. Choose from mesh seersucker shorts, moisture management shorts, low-rise compression shorts, braided mesh shorts, mesh shorts with madras inserts, ribbon mesh shorts, hole mesh shorts, mesh shorts with polka dot inserts, waffle shorts, Hawaiian shorts with mesh side panels, and shorts with and without pockets. Sports Unlimited: This site offers a variety of shorts designs by Augusta and High Five Performance Team. Styles include dazzle shorts, moisture-wicking polyester shorts, wicking mesh shorts, Poly Spandex shorts, custom slam shorts, and more. Finally, most websites feature sizing charts so you can order the best fit, but be sure and check out their return policy in case the shorts need to be returned or replaced.